We provide geophysical Sensors world wide. Our Sensors are used all over the world for geophysics exploration. Oil and gas companies are using our Sensors geophysical for years and for years to come. We provide geophysics Sensors and Sensors geophysical to China, Russia, Uzbekistan and countries on 5 continents. Since Phoenix Geophysics was created we sold hundreds of MT systems and AMT systems, MT Sensors and MT Field Sensors, and also AMT Sensors or MT/AMT (MT-AMT) Sensors. Tested on all kind of terrains in surveys, our geophysics Sensors and MT/AMT Field Sensors are the best aviable worlwide. All our customers are all agree about saying we are the best geophysics Field Sensors provider in the world. At Phoenix we design geophysical Field Sensors and geophysics equipement by our engineers. They are the best and come from Japan, China, Bulgaria and of course Canada. MT Field Sensors, AMT Field Sensors and both MT/AMT Field Sensors are tested and design for best results. Just ask us for a quote, our sales people are ready to describe all our offers about geophysical Sensors, and MT/AMT Sensors because MT magnetotellurics Field Sensors, or MT/AMT magnetotellurics and audiofrequency magnetotellurics or audio-frequency magnetotellurics Field Sensors. Since Phoenix Geophysics was created we sold also hundreds of Magnetotellurics and Audio-frequency Magneto tellurics systems, magneto-telluric Sensors and magneto-tellurics Field Sensors, and also audiofrequencymagnetotellurics Sensors or MT/AMT (MT-AMT) Sensors. Tested on all kind of terrains in surveys, our magnetotellurics Sensors and audio-frequency-nagnetotellurics Field Sensors are the best aviable worlwide. All our customers are all agree about saying we are the best magnetotellurics Field Sensors provider in the world. Phoenix offers a range of electrical and magnetic sensors for MT and AMT data acquisition. All Phoenix field sensors are highly reliable, lightweight, and manufactured to exacting standards. Designed for use in the most demanding environments, they have proven their reliability and quality on many thousands of surveys around the world. Combined with the V5 2000 System or System2000.net insrtuments, they provide excellent data quality over a wide range of frequencies. AMTC-30 magnetic sensor coils are used for AMT magnetic data acquisition. Weighing about 3 kg and measuring only 82 cm, AMTC-30 sensors are compact and portable while providing high-quality magnetic data at frequencies between 10 000 Hz and 1 Hz (natural signal) and between 10 000 Hz and 0.1 Hz (controlled source signal). 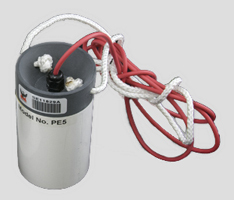 MTC-50H magnetic sensor coils weigh approximately 8 kg, and measure only 144 cm. 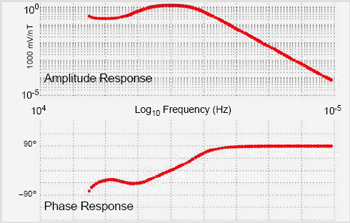 They provide magnetotelluric data at frequencies up to 400 Hz and down to 0.00002 Hz (50 000 seconds). 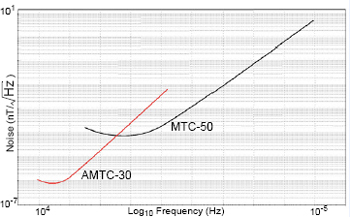 As of 2010, the MTC-50H replaces the older MTC-50 sensor. 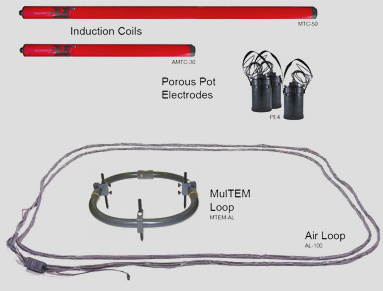 MTC-80H magnetic sensor coils are the newest addition to the induction coil family. Intended for use in MT surveys to moderate depth, they weigh about 5 kg (half the weight of the MTC-50H) and measure 97 cm in length (70% of the length of an MTC-50H). 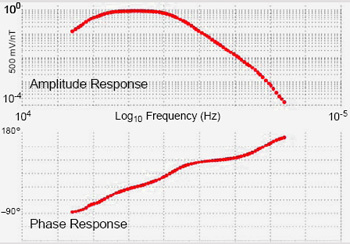 The MTC-80H provides good data from 400 Hz down to 10 000 seconds, depending on signal strength and local conditions. Note: The lengths given above include the PVC cylinder that slides on to the sensor to protect the connector; the cylinder is not shown in the photographs. The airloop model AL-100 is specially designed for vertical magnetic field MT measurements in stony and hard ground, where it is difficult to dig a hole for a vertical coil. The airloop is specially designed for vertical magnetic field MT measurements in stony and hard ground, where it is difficult to dig a hole for a vertical coil. Dimensions : 13 cm x 7.25 cm dia. 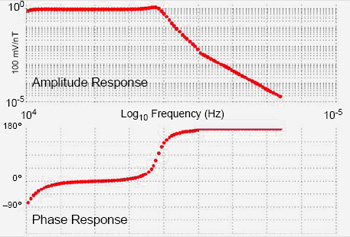 A low noise, low offset, low DC drift, non-polarizing, broadband electrode. Porous ceramic contact surface and PbCl2 slurry prevent polarization. Heavy-duty PVC and ABS construction protects against foul weather and temperature variations when buried in the earth. Various models available; Contact us for specifics.